One of the biggest mysteries in solar physics is how is it possible that the sun’s surface is colder than its atmosphere. At first glance, it seems that the sun’s atmosphere, called the corona, is hotter than the heat source which is preposterous given the second law of thermodynamics. So, either the sun doesn’t care of the laws of physics or something more subtle is at play. In physics, the second law of thermodynamics says that heat flows naturally from an object at a higher temperature to an object at a lower temperature, and heat doesn’t flow in the opposite direction of its own accord. This is one of the most intuitive laws of physics, yet as the heat travels from the sun’s surface, which registers a temperature of about 5,500 degrees Celsius, to the layer a few hundred miles away from its surface (known as the sun’s corona), it rises to a temperature of 1,000,000 degrees Celsius. This is the only instance in the known universe where the thing doing the heating is actually cooler than the thing it’s heating (along with other similar stars). If it weren’t enough, it’s actually about 200 times hotter than the heat source. So, what’s going on here? This is known as the sun’s coronal heating problem and has been baffling scientists ever since 1939 when the huge discrepancy was first discovered. A number of explanations have been announced, but it wasn’t until recently that tantalizing evidence surfaced explaining this peculiar phenomenon. A study published in 2012 in Nature Communications by researchers at Northumbria University found a possible mechanism that causes some stars to have a corona that is almost 200 times hotter than their photosphere (the star’s surface). 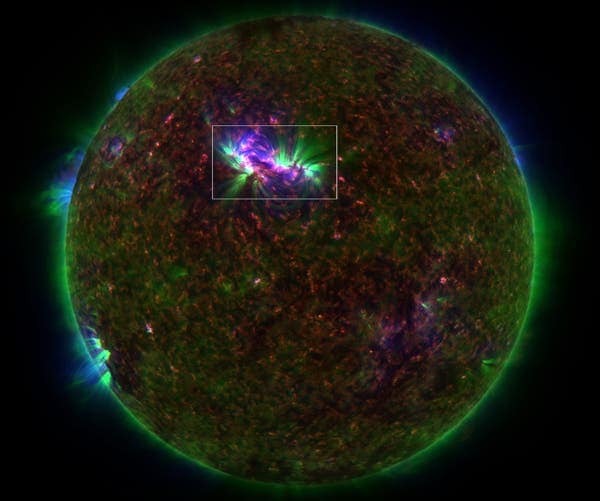 The researchers used cutting-edge solar-imaging technology to observe the Sun’s chromosphere – a distinct region of the sun’s atmosphere sandwiched between the photosphere and the outer corona. 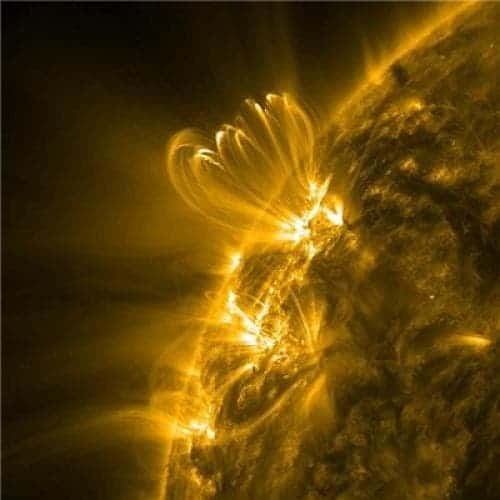 Here, the researchers examined magnetohydrodynamic (MHD) waves and measured their speed and power with unprecedented detail using the dedicated solar-imaging telescope known as Rapid Oscillations in the Solar Atmosphere, or ROSA. An estimation of the potential energy transported by these sort of waves was made, which matched those envision by researchers who first theorized that MHD waves distribute the energy generated below the star’s surface to the outer layers of the Sun’s atmosphere, thus being responsible for the heat anomaly. Northumbria’s Dr Richard Morto said: “The Sun is our closest star and provides a unique opportunity to study the properties of stars in detail. Stars generate heat through thermonuclear reactions in their core and the temperature decreases towards the star’s surface. However, a significant number of stars have higher temperatures at the outer edges of their atmospheres than they do on their surface. The MHD waves may not be solely responsible for heating the corona to dazzling temperatures. In 2011, a team comprised of researchers from Lockheed Martin’s Solar and Astrophysics Laboratory (LMSAL), NCAR and the University of Oslo claimed they discovered a potential source of hot gas that replenishes the corona: high energy jets of plasma that shoot from inside the photosphere (De Pontieu, B. et al. Science 331, 55-58 (2011)). “It’s always been quite a puzzle to figure out why the sun’s atmosphere is hotter than its surface,” says Scott McIntosh, a solar physicist at the High Altitude Observatory of the National Center for Atmospheric Research (NCAR) in Boulder, Colo., who was involved in the study. “By identifying that these jets insert heated plasma into the sun’s outer atmosphere, we can gain a much greater understanding of that region and possibly improve our knowledge of the sun’s subtle influence on the Earth’s upper atmosphere,” McIntosh says. These plasma jets, called spicules, are “long, elongated fin features at the edge of the sun,” according to the researchers involved, and it is their motion that could explain how the sun’s atmosphere, or corona, is a few million degrees hotter than the surface. In 2007, researchers identified what they called Type II spicules, extremely fast but short-lived jets that burst upward faster than 60 miles (100 kilometers) per second. The researchers combined data from NASA’s recently launched Solar Dynamics Observatory and the Japanese Hinode satellite to make direct observations of these fast-moving jets of hot plasma for the first time. “By identifying that these jets insert heated plasma into the sun’s outer atmosphere, we gain a greater knowledge of the corona and possibly improve our understanding of the sun’s subtle influence on Earth’s upper atmosphere,” said Scott McIntosh, a solar physicist at the National Center for Atmospheric Research in Boulder, Colo., who was also involved in the study. In any case, it may be that there are more coronal heating mechanisms than the currently discovered MHD waves or plasma jets. Suffice to say, what was once an insurmountable mystery is now slowly unraveling its secrets.